Order Suma Flaked Almonds 125g from the Online Health Food Store UK. 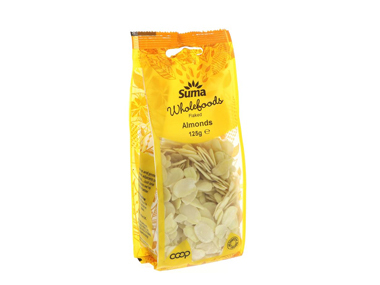 Buy Suma Flaked Almonds 125 grams and other quality Nuts safely online in the UK. Almonds have a high calcium content (typically 250mg per 100g). Almonds are used in many sweet recipes, including marzipan. Where to buy Suma Flaked Almonds 125g safely online? Shop at the Online Health Food Store if you are wondering where you can buy Suma Flaked Almonds 125 grams safely online in the United Kingdom. Flaked Almonds 125g - Suma Flaked Almonds 125 grams in Nuts and Foods.